Use this address only to send mail to your camper during the summer. For all camp business, use the Bay Area Office address. Mail your first letter 2-3 days before your camper leaves for camp (especially for one-weekers). It can easily take 5 days for a letter posted in the Bay Area to get to your camper. Do not send food of any type to campers. If sent, it will be collected by a staff member and will not be returned to campers. If you want to send your camper more than a letter or postcard, consider a magazine, book, deck of cards, small game, or clean teeshirt. Send all mail by US Postal Service. The post office does not accept mail from UPS, FedEx, etc. 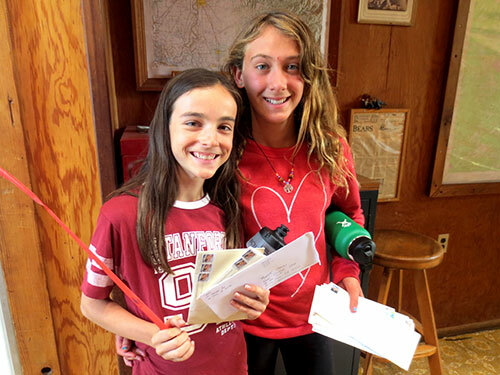 Campers love to receive mail that is newsy, upbeat, and supportive of what is going on at camp. They want to know that you look forward to hearing stories of their adventures at camp and are proud of their ability to handle new and challenging situations. Avoid telling them how much you or their pet misses them as that can make any homesickness worse. If you have an urgent message for your camper, call camp’s Bay Area Office for assistance. There is no landline or cell phone service at camp. For emergencies and communications between camp and the Bay Area Office, we use satellite phones. The phones are turned on to make essential outgoing calls and at pre-arranged times with the camp office. Camp also has satellite-based Internet service, which is limited to staff use only.